This is definitely one of the few brands that my skin is hiyang to. I've been using Human❤️Nature for about a year now and I've noticed that my skin has improved a lot. I'm not high maintenance, so I'm glad these are very affordable and can be bought from major supermarkets. I rarely really go to the derma or facials, so I see to it that I clean my face everyday. The routine is simple -- facial wash, toner, and moisturizer. 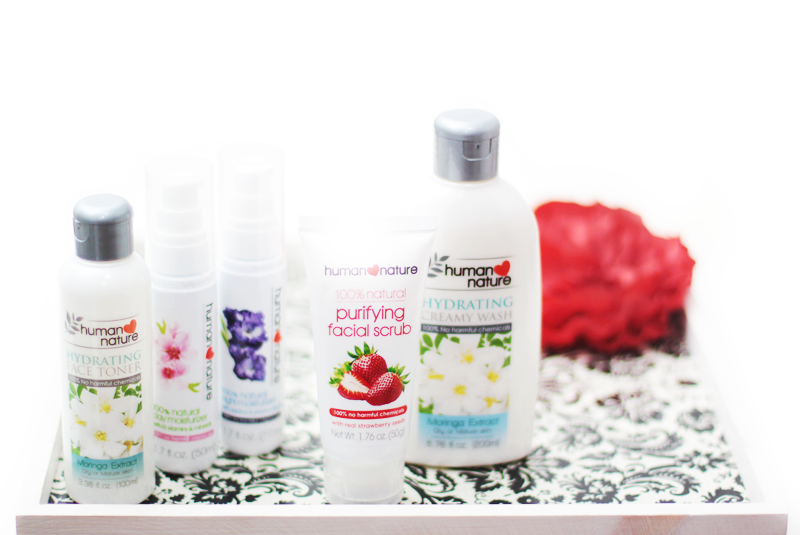 I'm using Human Nature's Creamy Wash (for Dry or Mature Skin). It got me at mature. Haha. Well, I'm in my 40s, I need all the help I can get. This one cleans the skin and yet, it does not dry it out. It really is very gentle on the skin. I also recently discovered the Purifying Facial Scrub made of real strawberry seeds. I use this once (sometimes twice) a week to exfoliate dead skin cells. My skin always feels supple everytime I use this. I'm using the Hydrating Toner because, again, it's for mature skin. Haha. And then there's the Day Moisturizer which I use only when I feel like my skin is really dry (cold months, mostly). But I use the Night Moisturizer daily before I sleep. I really love that the moisturizers are in pump bottles because it's quite practical. I'm glad I found these products to help me keep the wrinkles at bay. Behind these wonderful products is an inspiring story. I love HN! I discovered the brand while volunteering for Gawad Kalinga a few years back. I love their sunflower oil too, swapped it for my old moisturizer and never looked back. Sometimes, it feels icky so I slather on their daily moisturizer on top for mild fragrance. My hubby is into HN too, in fact he's the one who reminds me that we're due for a visit to Human Nature when we're in Cagayan de Oro. The sunflower is the only thing that keeps his occasional pimples at bay. Sadly, wala pang HN dito sa Dumaguete. Hi Joselle! Glad to know you and your hubby are both using HN! It really is a good brand. I love the sunflower oil, too! I use it when my oil gets too dry. I hope they open a branch in Dumaguete!